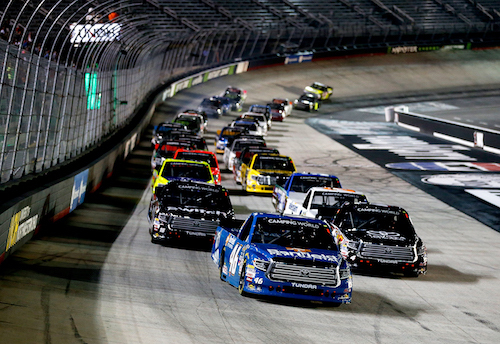 The NASCAR Camping World Truck Series wraps up its regular season at Bristol (Tenn.) Motor Speedway on Thursday with its running of the UNOH 200. Johnny Sauter, Brett Moffitt, Noah Gragson, Justin Haley and Ben Rhodes have clinched playoff positions, already, provided they take the green flag Friday night, as NASCAR rules stipulate that drivers must attempt to start all races of the regular season to be playoff-eligible, unless a waiver is granted by the sanctioning body because of a special circumstance. Eight drivers will have berths in the playoffs at the checkered flag Thursday, so at least two drivers will advance on points, three if there isn’t a new 2018 winner at Bristol. Grent Enfinger, Stewart Friesen and Matt Crafton are the three drivers in position to advance on points. Enfinger and Friesen have significant enough cushions that that they’ll advance on points when he takes the green flag Thursday night, regardless of where he or anyone else finishes. Crafton also is solidly enough in eighth to advance on points, as long as the Bristol race doesn’t produce a new winner, other than Enfinger or Friesen. The only way a driver heading into Bristol on the outside looking in may replace a driver in a provisional playoff spot is by winning Thursday night’s regular-season finale.